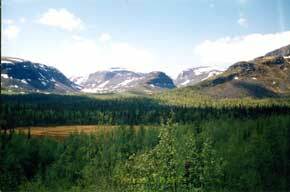 The Lovozero Mountains are situated in the middle of Kola Peninsula in Russian Lapland on the eastside of the Khibiny Mountains. You can say they are sisters. The west slopes of the Lovozero Mountains are washed by the Umbozero Lake. 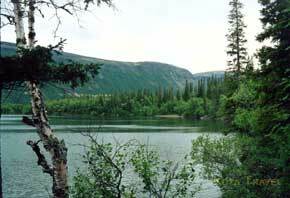 The east slopes of Lovozero Mountains by the large lake named Lovozero ozero. The Lovozero Mountains have a form of a horse shoe with in the middle Seidozero (Saint Lake). The Lovozero Mountains consist of bulgy gently sloping flanks and a plane plateau - like summits. The highest point is Mount Angvundaschorr of 1.127 m. In Lovozero mountains you can find an old glacier which feeds the Svetloe River and Svetloe Lake with crystal clear water. For example you see in the Svetloe River the tiniest stone laying on the eight meters deep bottom. 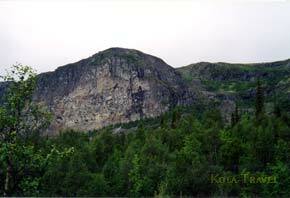 In the Lovozero Mountains you can find saint stones (Seids) left by Lappish people and the 'Kuiva', a gigantic 'rock painting like a shaman' on a vertical mountain wall created by the nature itself. The Lovozero Mountains and Khibiny Mountains and the are rich in deposits of rear minerals. Close to the Lovozero Mountains you can find two small villages named Revda andLovozero. 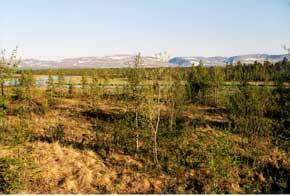 Revda village is related to a small mining area where most of the inhabitants are employed. Lovozero village is the capital of the Saami people and has a municipal relation with the capital of the Norwegian Saami people Karasjok.